When the M5 runs out and the village of Kenn appears, you know that you’re in Devon. Quaint, thatched houses with painted cob walls, a parish church built of local auburn-coloured Heavitree stone and a pub with its hanging sign hidden among a speckling of flower baskets – this is old England through and through. Yet if Kenn feels like an ‘end of the road’ destination, The Wood Life goes one step further. It’s only once you pootle out of the village, down the kind of country lanes where the hedge is wider than the road itself, and splash through a shallow, cobbled ford that this hideaway can be found, tucked among the trees where the road quite literally ends at the head of the valley with only open swathes of countryside ahead. Comprising two distinct lodgings at two singularly stunning locations – one a single glamping wagon set amidst an old orchard; the other a spacious, family-friendly safari tent – The Wood Life offers it's guests luxury facilities and exclusive use of a truly glorious corner of Devon, brimming with flora and wildlife. The former, Orchard Wagon, could well have been abandoned to the wilderness in the hopes of never being found, such is it’s seclusion, but abandoned it is not – something all too clear when you step inside. A light, white-walled interior with cute windows that look out into the lush surroundings lends a dainty, cottage-like feel to the place. It’s as if the design has been based on a spread of fine Devon cream teas – traditional, sweet and practically perfect in every way. The double bed is crafted out of coppiced chestnut from a few miles away and a pair of quirky up-cycled lamps, one on either side, bring a glowing warmth when evening descends. The beauty and craftsmanship of the main hut is equalled by its ingenious complimentary bathing wagon, situated just a few yards away. Built on an old farm trailer and offering en-suite-type facilities with a view, the wagon’s large rear window can be opened so that you can light the wood-burner and soak in the deep bathtub looking out across the open countryside. The more prudish can close themselves away, enjoying the steamy setting and the wonderfully woody smell of the handcrafted hut. Just down the road lies Orchard Wagon’s sister site, Woodland Camp. With only one safari tent across set in it's own eight acre woodland, complete with treehouse, see-saw and a giant swing, there’s no danger of overcrowding here. Set atop a wooden deck, this stylish, spacious handmade tent (sleeps six) combines the charm of camping with all the creature comforts of home. The two bedrooms (a double and a twin) are nicely furnished with rugs, pillows and soft lighting, whilst the kitchen comes equipped with all the utensils under the sun. Cooking can be done inside, but with those splendid panoramic woodland views, why not rub sticks together and get that open fire going. Logs come in plentiful supply, but if you'd like to split your own, go for it, it's surprisingly therapeutic! Despite the romantic, ‘middle-of-nowhere’ feel of it all, owners Matt and Amanda do live close by. They provide a slice of their rural privacy, yet are also attentive enough to ensure you settle in and are full of advice and pub recommendations. Should you fancy a change from cooking in the exceptional al fresco kitchen, the flowery village local, The Ley Arms, is well worth a visit. It means breaking the bubble of your new hidden world, but if you want to discover the joys of the Devon coast then you would have had to do that anyway. So hey, the pub is certainly a good place to start! And for ventures further afield, Dawlish Warren beach (nine-time winner of the Blue Flag Award), Dartmoor National Park and the Cathedral City of Exeter are all only five miles away. The perfect place for a spot of seaside family fun, visitors can take a boat trip around the bay, keeping one eye out for playful dolphins, or catwalk down the breakwater and try to catch some mackerel for tea. 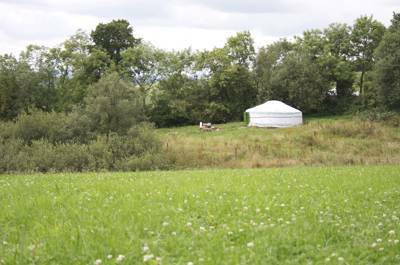 At the Wood Life we believe in glamping in glorious isolation. It's quite literally 'the end of the road'. After the M5 has run out of steam, you've wiggled around the country lanes for 3 miles, crossed a shallow cobbled ford, you run out of tarmac at an old orchard set next to a quaint flint and brick farm cottage. Now there are only miles of green lanes and old drovers paths before you. Get away from it all in a beautiful bit of countryside, watch the buzzards soaring, the bees buzzing round the wildflowers, light a fire and let all the cares of modern life slip through your fingers. Less than three miles from the South West Coast Path with walking and cycling maps provided. Well-behaved dogs by arrangement. All bedding, bathing, cooking equipment provided, all you need is your clothes and food. 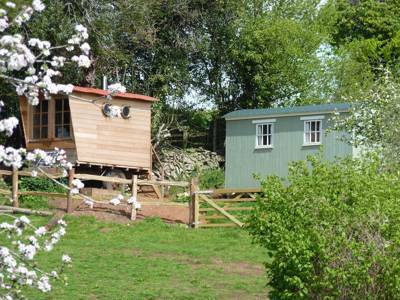 Orchard Wagon comprises a shepherd's hut, bathing wagon and field kitchen on its own in an old orchard – sleeping two adults. 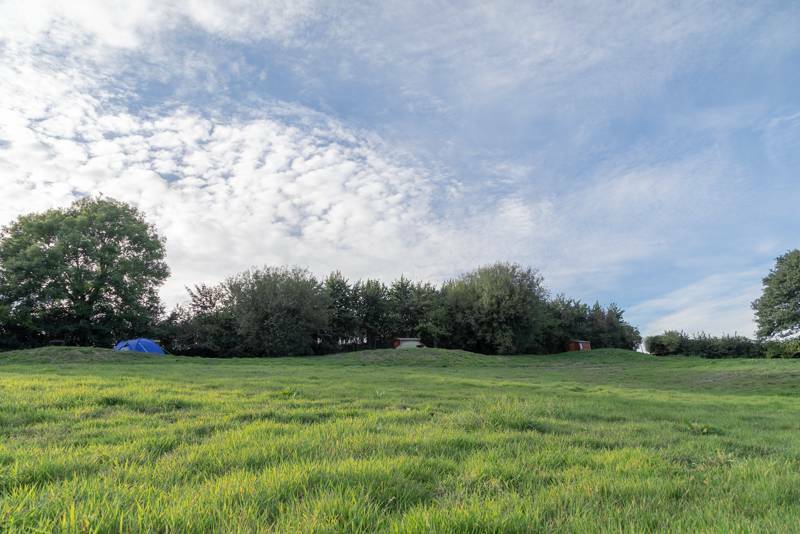 The Woodland Camp situated a couple of miles away features a large safari tent sleeping up to six – perfect for families or spacious retreat for couples. The shepherds hut acts as a bedroom, with mains power, a fridge and kettle with tea and coffee all provided and there is a separate bathing wagon with a bath at one end beneath large windows. Water is heated by a woodburner, the lights are on the mains and there’s a composting loo. There is also a small outdoor kitchen with two gas rings, all pots, pans and crockery, oils and fresh herbs gown on site. There’s also a fire pit with outdoor cooking equipment including a dutch oven to hang off a tripod over the fire, a bbq grill and all wood supplied. There’s an outdoor table and chair, bench and seating round the fire, all set next to a beautiful old apple tree and surrounded by wildflowers. The safari tent in the Woodland Camp down the road lies within 8 private acres of private woodland and features a well-equipped kitchen with gas-powered fridge, large dining area, chestnut veranda and wood burning stove. At the head of a small valley, the site is ideal for walkers and cyclists – Haldon Forest (03000 675826) in particular has loads of cycle trails. There’s horse riding within 3 miles, golf within 4 and fishing is only half a mile away. For most, though, the coast is the main attraction, with excellent wild swimming at Coryton Cove (8 miles), a secluded beach close to Dawlish, where dolphins have been spotted. Dartmoor National Park (01626 832093) is also accessible, while closer to home the riverside walk at Fingle Bridge or simply exploring the village footpaths reap real rewards. For an afternoon of history head to Castle Drogo (01647 433306) in Drewsteignton. There are photo opportunities aplenty at Clovelly, a pretty fishing village where Charles Kingsley was inspired to write the Water Babies. Chat to Matt and Amanda for suggestions. The outdoor kitchen provides everything you need onsite, including a gas burner, a camp firepit with a dutch oven and bbq grill and all the pots, pans and fresh herbs you could want. There's a great local farm shop – Powderham Country Store (01626 891883) and local pub, The Ley Arms (01392 832341), is only a mile and a half away in Kenn. Other good local pubs include The Nobody Inn (01647 252394) at Doddiscombsleigh or the Turf Locks (01392 833128) on the banks of the river Exe and Exeter Ship Canal. There are a few nearby establishments that serve good quality, affordable meals including: The Huntsman Inn(01392 272779) in Ide, The Royal Oak (01392 832332) in Exminster and The Chi in Kenton (01626 890213). For fine dining, head to the HH Restaurant (01392 461472) in Broadclyst (just outside of Exeter) which serves modern British food with a French twist. £100 per night, Mon-Fri or Fri-Mon bookings only. For safari tent bookings, contact the site directly. There is a train station at Exeter St David’s and a bus from Kenn that goes to Exeter twice a day, so this is really a holiday for people with cars or enthusiastic cyclists or walkers.